I was delighted to learn my art was selected for a solo exhibition at the Columbia Art Center in Columbia Maryland for February 2013. I applied 18 months prior and had pretty much decided I hadn't been selected, so the notice came as a surprise. The timing is actually very good since I retired from system engineering 6 months before I received the notice and am now focusing full time on my art. At the time of the notice I just started to realize that many of the planning skills I used nearly daily in engineering are going to be needed in my new art career. ﻿﻿I am not alone when I thought as an artist I could leave behind all those business skills learned over many years as an engineer and just enjoy painting. Painting has always been my respite allowing me to get grounded and leave behind the many stresses of my career and "become human again." I want to just paint and have fun. However, I also know that I want to sell more of my work than I previously have. So six months after retiring and with several successes at getting my art accepted into National exhibitions, I realize that I am not going to be able to keep all the deadlines for shows (entry, shipping, receptions, pickup or return shipment) in my head and that my electronic calendar is not really the right answer for making sure I am ready for an exhibit when the time arrives. Adding a solo exhibit on top of planning for other exhibits and meeting with gallery directors made me decide that I need to bring some of those old planning skills into my art business or I will go crazy. Yes that means admitting art is a business and treating it as one. I can't just get up in the morning, have breakfast then paint for most of the day. I have always been someone who keeps lists of things to do, but having a few sheets of paper with things to do written on them is not going to cut it. After all, paper is easy to misplace so then your plan is literally gone. Not a good thing. So I decided to use a spreadsheet to track what I need to do and when it is due. It is easy to add new items to the plan as I think of them. Actually I now have several spreadsheets. Now all my friends from engineering are laughing because I've always LOVED making tables to present my thoughts. One spreadsheet is my plan for the solo art exhibit. So what did I put in the list? The Columbia Art Center gave me a great list of what they need from me plus when and what they will do. That was a great place to start, so I put all these items as rows in the chart. I shaded the items the art center is going to do so I could keep track of their tasks separate from mine. I added in other things I will have to do to get ready for the exhibit that the art center didn't have in their list. There are columns for each month. If a task is a simple item, like deliver an inventory of art to be in the exhibit, then I simply enter the date it is due to the gallery under the month. If the task has many parts like (get all the art framed) I initially mark a start and end month for getting this done and later add in details on which paintings I need to get framed each month. Now here is the tricky part that really needs planning. I proposed an exhibit titled "Travel the World in Transparent Media". The exhibit includes both my paintings and my fused glass. I noticed that the subjects, style, and colors of my paintings and glass often are similar. I create something in glass that inspires a painting and vice versa. The show plays off that theme and at the same time features my work that captures places I have visited internationally and in the United States. This means I must select work telling an interesting story about my travels and those with a connection between my two art media. Since I'm very visual I create an Exhibit Layout, shown above. I use Photoshop and start by creating a document that shows the dimensions of the walls. Each vertical line represents a separate wall. One wall is taller than the others so I put the dark rectangle at the top of the shorter walls to block out the extra height. I set this up so 2 feet equals 1" in the diagram then started to select art that fits the theme of the exhibit and sized those images to the same scale. A 2 foot by 2 foot painting was shrunk to 1" by 1" and inserted into the document. I then moved around the art to make an interesting flow. Both the subject and the color of the art have to make sense so that as you look at the exhibit it is pleasing to the eye and the subject matter also transitions nicely. Next my 3-dimensional glass art is placed on "pedestals" and situated so they are near their companion watercolor. There are also several wall hung glass pieces interspersed on the wall. I print this visual plan on several sheets of paper, tape them together and hang it in my studio so I can see whether the layout worked. Initially I had concepts of paintings marked in spots because I needed to create a painting that would fit there. Over the last few months I move around the pieces or add images of new work that I think might fit better and the plan changes. The image above shows the current plan, but who knows, it may change again. I have a little over a month before I have to deliver the inventory list to the art center at which point the plan freezes. The spreadsheet with my "To do" list is on the refrigerator so I can check it each week and make sure I know what needs to be done in order to stay on plan. Every now and then I edit my spreadsheet and shade the boxes for completed tasks green so I have a sense of accomplishment. Then I print it again. If I think of a task I missed in the original plan I just add it. It really helps me stay relaxed and not fret over what I need to do. I actually think I have more time to paint since I wrote down the plan and don't have to worry about it any more. If you are an artist and struggle with keeping it all together, try making lists. You don't have to use a spreadsheet, but find some way to list the tasks you need to do and post it somewhere accessible so you can check it once a week, mark off what you did, and identify what you should do next. You'll be surprised how much stress it takes away to spend a couple hours focused on making a plan then just following it. While interacting with my customers I realize how much I have learned about watercolor over the years and realize it is not necessarily common knowledge to those purchasing art. Here are some topics I've gotten questions about that I will address here. How should I frame a watercolor painting? What does it mean to have archival materials? What does "limited edition" print mean? Unless the artist has varnished the watercolor, it is important to mat and frame your watercolor under glass or Plexiglas. The glass protects the painting from the environment and the mat gives a space between the painting and the glass so the painting can breath. A little air circulation is important to keep moisture from forming under the glass and settling on the painting. Since most professional watercolor artists use archival materials when creating their art you want to make sure the mat and backing board are archival. If they are acidic then they can cause the watercolor paper to become acidic and turn yellow or darker in color. The width of the mat depends on the size of the painting. If you go to a framer they can help you with this. I think my mats are generally about 1/6th to 1/5th the narrowest dimension of the painting. For a 22" X 30" painting I use a 3.5" mat; while my 22" X 15" paintings are generally in a 3" mats. When using a wooden frame a paper cover is generally attached to the back of the frame which helps keep dust and little insects from finding a home inside your painting. Archival materials are acid free. Papers that are not acid free will darken or yellow over time. Wood pulp is acidic in nature and some lower grade watercolor papers include wood pulp. I use Arches 140 lb fine art watercolor paper, which is 100% cotton rag, mould-made, and acid-free with a traditional matte finish plus a water-resistant coating, all free of optical brighteners. This paper complies with the highest archival standards and is extremely age resistant. Wilhelm Imaging Research, Inc. predicted-years of display rating is 100 years plus. I also use fine art watercolor paints. These paints are rated for their permanence, also know as their light fastness. I predominantly use Daniel Smith Fine Art Watercolors along with a few professional artist paints by Windsor and Newton and Holbein. These paints all use the American Society for Testing and Materials (ASTM) light fastness ratings which are as follows: I = Excellent, II = Very good, III = Fair, IV = Fugitive. Fugitive means the color will disappear in a fairly short amount of time. I generally buy only those with an Excellent rating since I don't want my paintings to change color with time. Occasionally I will purchase a paint rated at Very good, but I avoid the Fair and Fugitive ratings. Some challenge that even the water used makes a difference with the acidity of the final painting, especially for those who "stretch" their paper by soaking it in water before attaching it to their painting surface. I don't "stretch" my paper and have some doubts that the acidity of water really makes a difference. However, I do happen to have a water neutralizer in my home which changes our naturally acidic well water to base or neutral. We have this to protect our pipes since we noticed when we first purchased our home that the copper pipes were leaching and leaving blue stains. The neutralizer fixed that problem and provided a secondary advantage to eliminating acid from the water I use when painting. When framing my work I use mats that have also been tested for their acidity and are rated as archival. Similarly the backboards are of archival materials. This is important. I kept one of my first color pencil drawings since it had taken so long to produce I couldn't bear to part with it. The framer I used either didn't know about archival materials or didn't educate me on the difference. After about 20 years I noticed the paper of my art was beginning to yellow, so I immediately took it to my new framer and had it re-framed in archival materials. I was lucky that by then I had learned about the impact of acid paper on my work and knew what the problem was when it started to yellow. The short version is that I use durable, high-quality materials in my paintings and framing that are expected to provide a piece of art that will last a lifetime. I obtain prints of my watercolors from a business that uses archival materials. The prints are made on watercolor paper and the inks are rated for a minimum of 25 years. I provide a certificate of authenticity with each of my archival prints. I obtain the certificate from the printer (visit their website Archival Arts for more information). The certificate includes information about the inks, media and equipment used to produce the print. Certificates provide a guarantee that you are getting a quality reproduction of my artwork that matches the art perfectly. A limited edition print has a designated maximum number of prints that will be made of the image at a designated size. Limited editions can be as low as 10 or as high as 1000. A limited edition is normally hand signed and numbered by the artist in the form (e.g.,14/100). The first number is the number of the print itself. The second number is the number of overall prints the artist will print of that image. The lower the second number is, the more valuable and collectible the limited editions are likely to be, within whatever their price range is. In my case, most of my limited edition prints are limited to a print run size of 50; a few are limited to 25. I hope this information helps with the quagmire of terms that appear in the art world. If you have been wondering about other terms I use in my blog or on my website, don't hesitate to ask. To see a selection of April's archival prints visit her online store. We drove through Sololá, Guatemala on the way to Chichicastenango from Lake Atitlan. Unlike many of the men in the central highlands of Guatemala, the men in Sololá tend to wear their indigenous clothes. Their black and white jackets include a design that represents a bat-– the symbol of the last Cackchiquel dynasty. They also wear striped trousers with black wool over the pants, a waistband, an apron and tzute, a black felt or straw hat, and leather sandals. You can see the man in the foreground follows these traditions. The women wear the traditional Huipil (pronounced wee-peel), which is the Spanish word for the traditional blouses. In Sololá the Huipil has red stripes rather than flower designs found in other parts of Guatemala. Their skirts are a dark-blue with embroidered stripes of many colors. As always the colors of the town as well as their traditions called to me to share. Street in Sololá is my homage to this town. 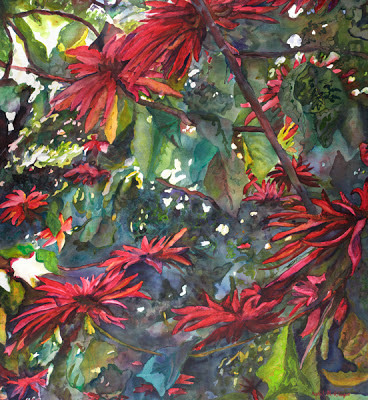 This painting received the 2nd Place Award in a Baltimore Watercolor Society exhibit. Comalapa, Guatemala. Because I was not feeling well and wanted to rest, I had stayed on the bus while everyone else went into the market. After I started to feel better I spent some time photographing Guatemalans as the went to and returned from the market. I was sitting in the bus taking photos through the windows trying not to be noticed since I was interested in natural gestures and body shapes in these photographs, not posed vacation photos. This photo, like many of the others I took that day, were rather out of focus and distorted because of the bus windows, which were far from clean, but I found this actually helped me be more creative in my painting. Since she was walking quickly the photograph had very soft shading and was somewhat blurry. I wanted to capture some of that blurriness since I felt it represented some of her focus on getting to the market, so I intentionally made her legs and feet a little out of focus. To achieve a soft edged painting, I had to work very wet-into-wet to allow edges to blend into the next shape. I spend a moderate amount of time deciding on how to place the woman in the frame of the painting to make an interesting composition. I also spent some time playing with new pigments I had received that I thought would granulate and make interesting soft textures. As you can see I also love to incorporate drips into my watercolors when I think they will enhance the feel of the painting. I believe these broke-up the sidewalk and make the background more interesting without distracting from the woman. My husband Chas and I had a great time at the New York Botanical Garden. As always I took lots of photographs while there. The current exhibit in and around the Haupt Conservatory was called "Monet's Garden." The exhibit included the types of plants Monet had in his gardens and the structures inside the display had been painted in colors to match the arches, bridges, and benches in his garden. I really loved the architecture of the conservatory itself and took several shots of the wings of the conservatory. 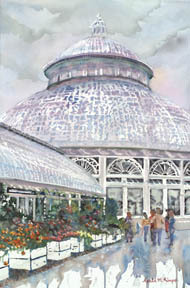 The Conservatory is my first painting inspired by our visit. Frequently my design process begins with some time in Photoshop. I may modify the colors or use some of the artistic filters to achieve a look close to the way I want the painting to look. On many occasions I have to move items around or take parts of multiple photographs and combine them into a single image that I will use for my painting reference material. I find it easier to compose in Photoshop than having multiple separate references and composing as I paint. This process allows me to test ideas before my brush touches the paper. 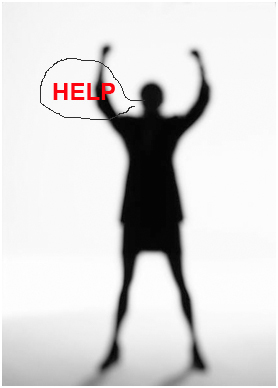 Normally I have a goal and Photoshop just helps me realize it. In the case of "The Conservatory" I accidentally selected a Photoshop filter that I do not normally use. The result was a very simplified image that retained color in only the plants and flowers. Although I didn't like the rendition presented by Photoshop I did like the idea of limiting the color in the painting to select areas. This accident made me rethink my goals for this painting, resulting in this very simplified view where all the color was focused on the people and plants. In many ways I think the beauty of the architecture is more striking with this more minimal approach. Sometimes you just know exactly how you want a painting to look even before the event has occurred. As I stood in my hotel room poised at the window looking at the street scene below a transit street car had stopped to pickup passengers. I knew quite a few taxi cabs traveled the street perpendicular to the street car that I had only a small glimpse of from my window. I knew the orange of the street car and the orange-yellow of the taxi would make a great composition, enforcing the interesting angles of the streets and buildings. I patiently started to snap pictures hoping to catch a taxi in the frame before the street car moved on its way. Finally a taxi drove by and I caught its picture. Since I had seen this painting in my head and was able to catch it live, there was not much to do once I got home to compose the painting. 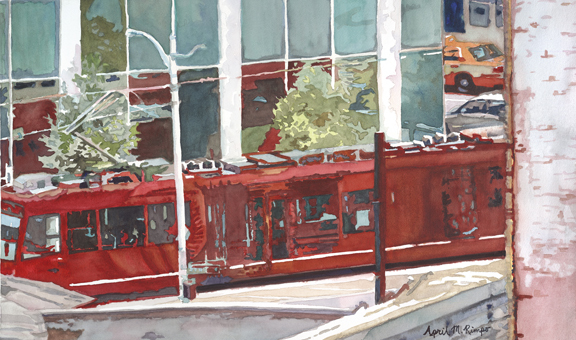 My primary job was to retain the repeated oranges (street car, taxi, and the reflection of the street car in the windows), simplify shapes, and adjust colors slightly in the windows to make the color theme work as I envisioned it. 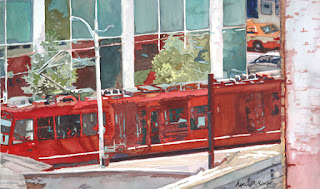 Had the taxi arrived after the cable car left I could have taken a picture of the taxi then combined the two photographs in my painting; but catching it live had become almost a game of chase to see whether I could get it before the street car departed. I liked how other buildings between my vantage point and the street car had created a natural frame on the sides of my composition, but I didn't want the details of the brick building on the right or the stripes of the building on the left to detract so I only hinted at the brick and essentially eliminated the vertical stripes. The angle of the wall in the foreground helped to accentuate the angle at the corner, so I retained a portion of the wall where I could repeat the angle formed by the street car and the taxi. Designing this painting in the moment was exciting and rewarding. Let me know what you think of the final result. Messengers speaks to a tradition in Guatemala practiced on All Saints Day. Many Guatemalans are very faithful Catholics and as a result All Saints Day is celebrated with a parade in which they pay tribute to Christ and Mary. It is also a time when they celebrate the living and their ancestors. The Guatemalan's visit their cemeteries in throngs, spending the day visiting with each other and with those departed. It is a celebration, not a sorrowful event. Flowers are everywhere and kites are sold so families can tie messages to the strings and sail these messages to their ancestors. The recipients may no longer be here in this life, as represented by the empty chair, but you get the sense that these conversations are a vital part of life. It's important to watch demonstrations and to attend workshops every now and then. If nothing else it reminds you of things you've learned but they have fallen into crevices of your brain that you don't seem to access any more. During the demonstration Frank Webb did for the Baltimore Watercolor Society this week, he used Phthalo Green, which is a color I have not included on my regular palette in a very long time. In fact I'm not sure it has ever been a regular part of my palette. I loved the colors he achieved with it, so I decided to use it in the dark regions in one painting I finished last week; I also incorporated Phthalo Green in "Messengers." I really enjoyed the result and will likely make it a regular color on my palette. It was fun to rediscover a pigment I owned but hadn't used for a while. Tall Ship Gloria is from the country of Colombia. It sails to events around the world, including events held in London prior to the 2012 Olympics and to Baltimore's Sailabration earlier this year. We saw the ship in Baltimore; no trip to London for us this year. I loved their enormous flag on the back of the ship and the sailors wearing their flags colors in a row along the rail. Since nautical flags us the same colors as the Colombian flag they were perfect little accents. Although normally all the sails are the highlight to me when I see tall ships, all the color in the flags was just to hard to resist, thus Tall Ship Gloria was born. Copyright April M Rimpo All Rights Reserved. You may share my work with attribution, but all other uses are prohibited. "Woman with a Wrapped Hat"
"Woman with a Wrapped Hat" was selected by Paul Jackson for inclusion in the Pennsylvania Watercolor Society's 33rd Juried Exhibition in 2012 ; was selected by judge Ratindra Das as recipient of the Excellence in Figurative award in The 29th National Exhibition 2013 of the Illinois Watercolor Society; and received the First Place award in the 45th Laurel Art Guild Juried Open. Thanks go to Lee Boynton who was the juror for the Laurel Art Guild exhibit. Below is a description of my inspiration and little about my painting process. This woman from Santiago, Guatemala was rewrapping her hat which is made of a long belt about 15 feet in length. This is a traditional hat in Santiago village, on Lake Atitlan. She smiled for the camera then asked for a small payment, which I happily provided. 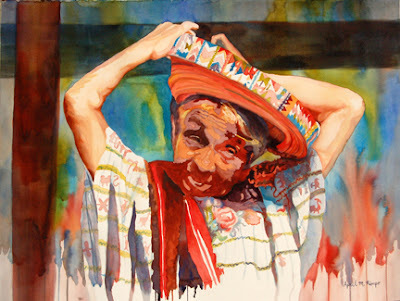 That smile and the colors in the hat cried out for me to paint them. I wanted to emphasize the orange red color and use it throughout the painting as an integrating design element. As a result I decided to use one of my favorite color schemes, a triad that uses primarily blue and orange with smaller hints of green. I love having very wet runs and drips in my paintings, since they are so specific to watercolor paintings. In contrast to these passages are the hard edges I used in her face. I added horizontal and vertical stripes which also contrast with the organic runs and the diagonal shapes formed by the woman's arms. 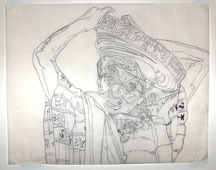 I start most of my paintings of people by doing an initial drawing on tracing paper. When drawing people I frequently shade portions of the face to ensure the contour lines are properly placed. I frequently make adjustment to the drawing as a result. I then use a fine tipped marker to emphasize the contour lines that I will then transfer to the watercolor paper. This photo is of the tracing paper drawing, which I hang in my studio for reference while I paint. Although I always hang these up, I almost never refer to them, but like knowing they are there in case I need them. The other photo below (right) shows a color grid I use to select which pigments to combine to get the desired flesh color. A long time ago I created this flesh color grid. The grid shows mixtures of different reds with a set of different greens. Each combination was about a 50/50 blend of the red and green. Sometimes it just clicks. Everything about this painting clicked. I remember taking the photograph in Chichicastenango, Guatemala. I was cutting through the local market to get back to my group when I saw these hammocks. Although in a hurry, I stopped in my tracks and took a few photos. When reviewing these photos recently this memory and the feelings I had at the time immediately pop right back. Chichi is known for its colorful native markets, which are held each Thursday and Sunday. The ethereal patterns of the hammock netting against the sky and the bright colors of the hammock chair swings were a combination I couldn't resist. The linear lines of the fabric that curved with the shape of the hammock contrasted with the straight diagonals of the dowels that held the hammocks. Making sense of these interesting patterns was the challenge, but one worth trying since I wanted to share the beauty if I succeeded. 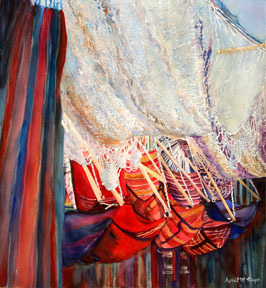 Despite the apparent complexity of the hammocks this is one of those paintings that just worked. Perhaps my love of the scene just took over. I had considered this a test painting, to see if I could make sense of the netting, done in preparation for another painting. I'm really happy with the results of the test and hope you like it too. In case you are wondering, the brilliant reds, pinks, and oranges are thanks to Daniel Smith quinacridone pigments. In case you have not read the other posts about the creation of this painting, here is a recap of the motivation followed by my thoughts on the last few steps of the painting process. A beautiful beach at Santa Catarina Palopo, Guatemala was the inspiration for this painting. This was the first time I’d seen the dugouts used by the Guatemalan men to fish on Lake Atitlan. Although much of the paint had faded and flaked from the hulls of these handmade boats, there was enough remaining to show the rainbow of their previous colors. In the distance some modern boats were visible, which will allow me to emphasize the difference between modern influences caused by tourism and the indigenous traditions of the local population. You may recall in my last post that I had completed the shadows under the boats and that they looked too dark against the white of the paper. As I painted in the boats I found that the shadow right beneath the boat needed to be bluer and darker than the shadow further away from the boat, so I added some darker blues to these portions of the shadow. Some yellower greens were added on the left to show they were closer. The man and distant boats were also completed. I feel the final result really captures the beauty of Lake Atitlan and dugouts in Santa Catarina Palopo. To read more about the creations of this painting read my other two posts on this painting.